Pierce steak gently on both sides. Combine steak and next 6 ingredients (through pepper) in a shallow dish; turn to coat. Marinate at room temperature 20 minutes, turning occasionally. Remove steak from marinade, reserving marinade. 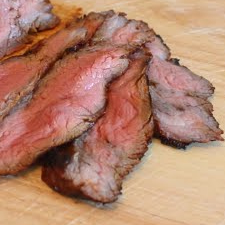 Place steak on a broiler pan coated with cooking spray. Pour marinade into a small skillet; bring to a boil, stirring well. Cook over medium-high heat 3 minutes or until thick and syrupy. Brush steak with half of glaze; broil 5 minutes. Turn steak over, and brush with remaining glaze; broil 5 minutes or until desired degree of doneness. Place steak on a cutting board; let stand 5 minutes. Cut steak diagonally across grain into thin slices. Per Serving: 265 Calories; 13g Fat (46.6% calories from fat); 5g Saturated Fat; 23g Protein; 11g Carbohydrate; trace Dietary Fiber; 58mg Cholesterol; 566mg Sodium. Exchanges: 0 Grain(Starch); 3 1/2 Lean Meat; 0 Vegetable; 1 Fat; 1/2 Other Carbohydrates.